Beethoven: IX. 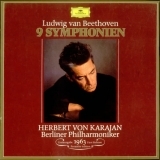 Symphonie is ranked as the best album by Herbert von Karajan / Berlin Philharmonic Orchestra. Members who like this album also like: The Doors by The Doors, Songs Of Leonard Cohen by Leonard Cohen and Highway 61 Revisited by Bob Dylan. The tracks on this album have an average rating of 78 out of 100 (5 out of 6 tracks have been rated). Showing latest 5 ratings for this album. | Show all 44 ratings for this album.